I happened upon a blog this morning. I'd say it was perfect timing to have found it. Yesterday I was speaking with a friend about how I wanted to bring back into my life some of the spontaneous, light heartiness I had when I was younger. She reminded me that it is still there, I just need to use it. Then I found this blog. Wasn't looking for it, it just found me. Thank You, Heather, for letting me speak my desire out loud. Thank You, Universe, for presenting this wonderful opportunity. Thank You, Inner Child Teresa, for following through. The blog is Art Abandonment. 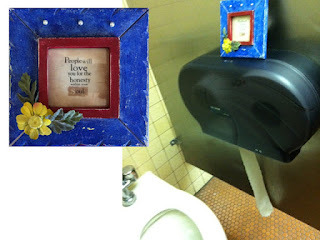 It's about randomly placing pieces of art in public places for other people to discover as gifts. What a cool concept! This morning I made something and I had a blast . When it came time to deliver this piece I was like a little kid. I was surprised how nervously, giddy I was. I just returned from abandoning a piece of art. It was soooooo frickin fun! I went to Portillos restaurant and put my piece of art in the toilet area. I was in the stall waiting for everyone to leave the bathroom so I could get a picture. I thought that would be just a little peculiar if they heard me clicking my camera while I was in a stall. People kept coming in so I had to flush several times to cover my camera noise. I was silently laughing hysterically on the inside. You know the saying that there is more fun in giving than receiving. Well I'd have to agree! OMG- what a great idea!!! I love the thought and the action! I want to be in your "path". I think I will try that with some of my cards! Thanks for sharing! It's pretty incredible how things just happen- when you are open to noticing! I am smiling and giggling about the image of you, in that stall, flushing over and over again to cover the noise of your camera!!! Love that even Inner Child Teresa came out to play!